How Do You Spell INTERCESSION? Correct spelling for the English word "intercession" is [ˌɪntəsˈɛʃən], [ˌɪntəsˈɛʃən], [ˌɪ_n_t_ə_s_ˈɛ_ʃ_ə_n]] (IPA phonetic alphabet). 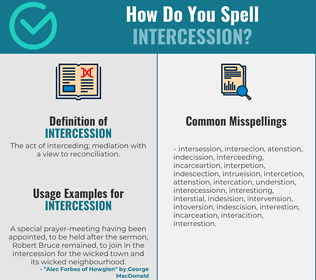 Below is the list of 316 misspellings for the word "intercession". The act of interceding; mediation with a view to reconciliation.